At 7am Bao rides the freight elevator to the top of one of Saigon’s newest high- rises and unlocks the door to the rooftop. His partner is already there setting up the rig – stringing thick ropes around a pulley then across a wooden board, looping and double looping. After 20 minutes of checking and rechecking knots, they lift the rig, with Bao squatting slightly above the board, from the roof and over the building’s parapet, 28 stories above ground. 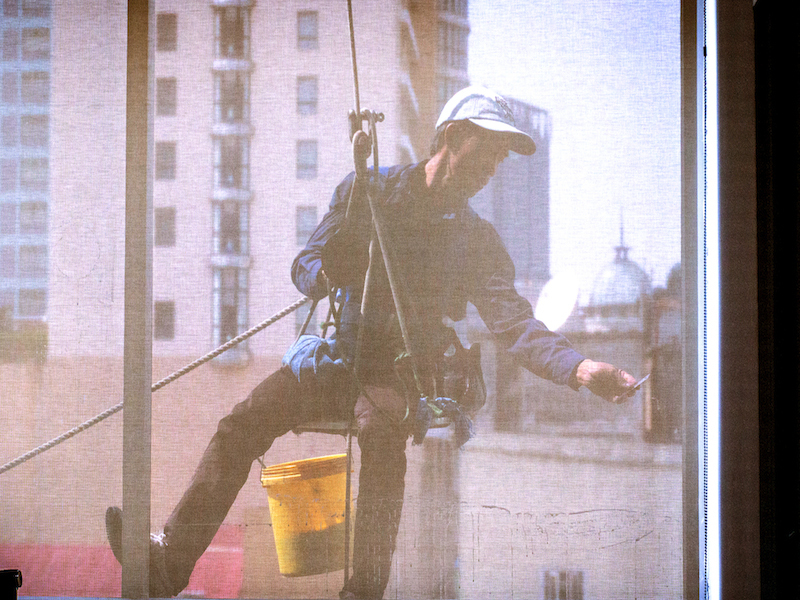 Finally secured and anchored in position, he dips his squeegee in a bucket of dish soap and water mixture and begins to wash the windows. Bao’s tools are basic, reflecting the infancy of his profession where roughly 10 years ago the city’s skyline was uninterrupted blue skies, not the steel and glass monoliths that dominate it today. As he continues to scale down the building a gust of wind sweeps by, gently swaying Bao to and fro, but he barely reacts, keeping in stride with his orchestrated up, down, left and right swiping hand motions. The wind, which blows capriciously around high-rise buildings, can make cleaning awkward. Updrafts and eddies that create uncanny microclimatic effects – a narrow tunnel of visibility from the roof to the street on an otherwise foggy day, rain falling upward against the palm of the hand – will drive the water sideways or even up across the glass, ruining work that has already been completed. “You try to hold your wand underneath the squeegee to keep the water from shooting all over the place. But there’s really not much you can do,” he shrugs. 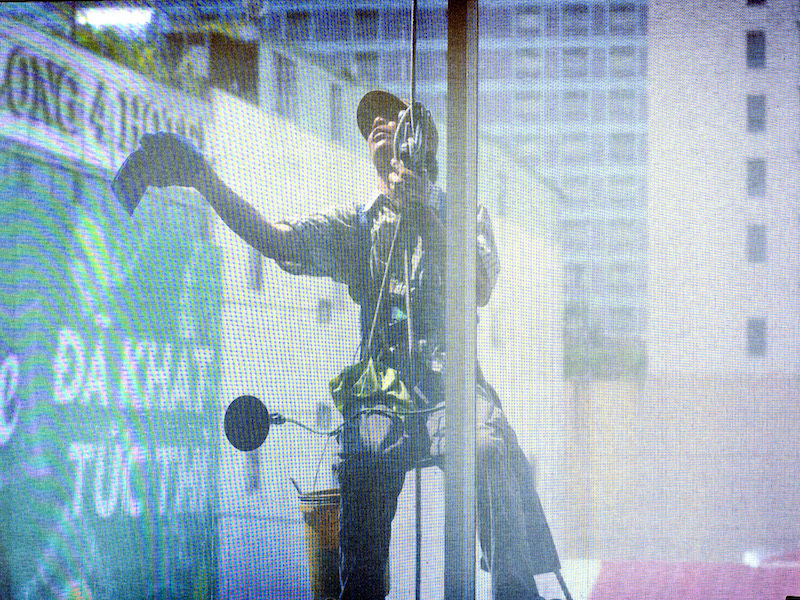 Outside or inside, the technique used to wash a window is the same: once the glass has been wetted down with a sponge or a wand, the water is wiped away with a squeegee, without leaving a smear. This is more difficult than it sounds. This movement requires a light touch and a smooth, serpentine glide – to chase the water across and down without the rubber edge of the blade leaving the glass, followed by a final motion of the wrist to flick dirt, water and squeegee off the window. 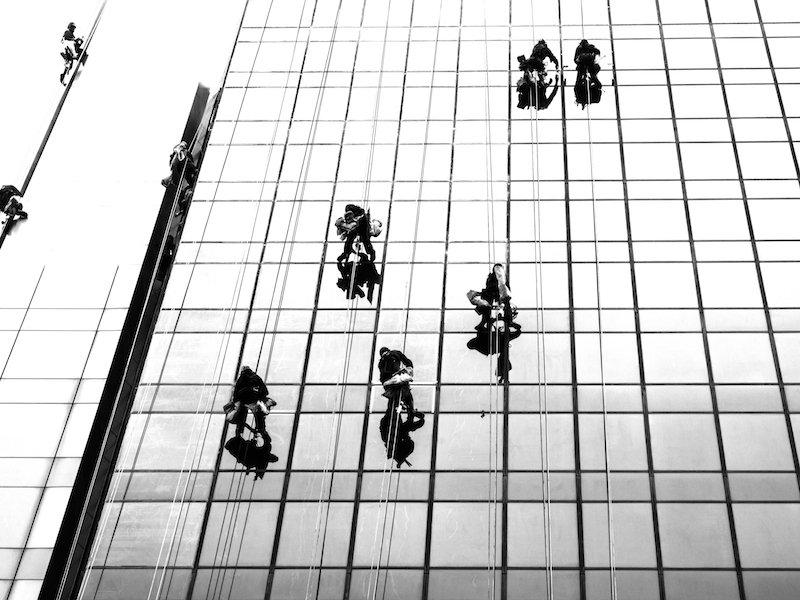 One day’s work on average takes around four hours; given good weather, it takes a month to clean the whole tower from top to bottom. 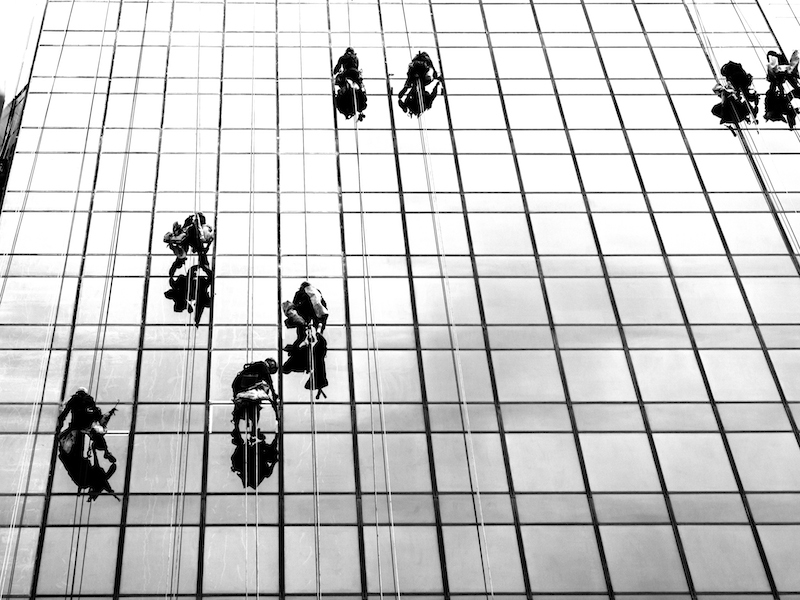 Work on larger skyscrapers in the city takes much longer: a single cleaning cycle on a building like the Bitexco Financial Tower can take six men four months. “Years ago, it was just straight up and down, flat glass, easy. Now everything they’re building is all angles. Look at Bitexco. It is very complicated with the curves. Also the washers have to make sure the windows on the observation deck floor are perfectly clean for customers because they pay money to look through the glass and see the city,” says Bao. “The windows on my buildings stay pretty clean during the dry season, you know. You might have bird droppings, which you have to scrub. It’s the rainy season that’s more difficult because the rain leaves spots on the glass and the wind blows dirt around. And for me, it’s more dangerous to work in those conditions. Sometimes heavy downpours happen when I’m halfway up the building and I can’t do anything because it’s too slippery so I sit and wait for it to stop,” he adds. of the sun which can cause heat stroke if he’s not careful. It’s now 11am and Bao finally reaches the ground. He unhooks his rig and shakes his legs, somewhat unbalanced, as if walking for the first time. Uncomfortable with being on two feet – the daredevil spirit in him is already looking forward to his next climb.